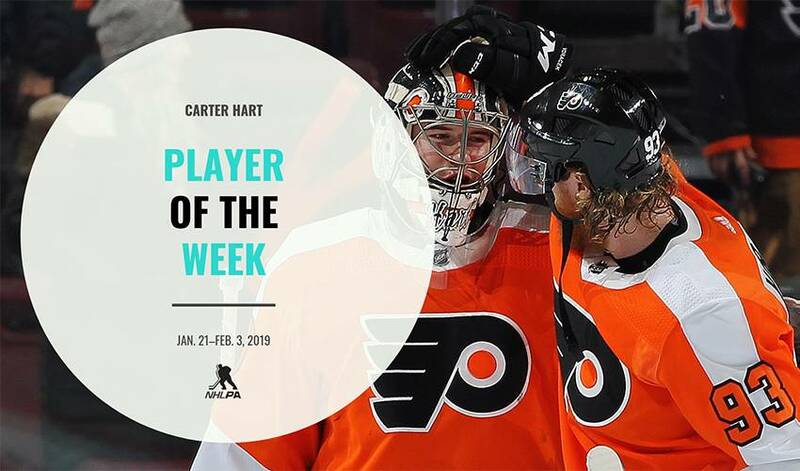 Carter Hart turned the page on the month of January, carrying a six-game winning streak while helping the Philadelphia Flyers to a perfect 4-0-0 week. The netminder stopped 94 of the 101 shots on goal he faced over three consecutive wins to help the Flyers extend their team-winning streak to a season-high seven games. All the while, he was acknowledged by the NHL for his outstanding play by being named January's Rookie of the Month. Over nine outings through the month of January, Hart went 6-2-1 with a 2.33 goals-against average and .931 save percentage and also led NHL netminders in saves with 283. Hart helped the Flyers to what was then a season-high fourth straight win by turning aside 31 shots on net in a 3-1 win against the visiting Winnipeg Jets Monday. The win was Hart's fourth consecutive victory and seventh of his NHL career since making his debut Dec. 18 against the Detroit Red Wings. "I've felt comfortable at this level," Hart said to reporters postgame. "The first game against Detroit, my nerves were crazy for that game. Then I realized it's just another game, the boards are the same, the ice is the same, just got to go out and play. That's the approach I have to have." His teammates echoed the 20-year-old rookie's comfort level after Hart earned the game's first star for his play. "Guys like [Patrik] Laine and [Mark] Scheifele, those guys beat some of the best goalies in the league. He looked like he was pretty confident in there, making some big saves," said Flyers forward Travis Konecny, who scored the game-winning goal in his 200th NHL game. Hart was given a day of rest in the second half of a back-to-back with the Flyers on the road at Madison Square Garden Tuesday night. Teammate Anthony Solarz made 38 saves for his first NHL career shutout in a 1-0 win over the New York Rangers to extend Philadelphia's win streak to five. After picking up their fifth straight win Tuesday on the road versus the New York Rangers, the Flyers continued along the road to Boston, where Hart backed the club to a 3-2 overtime win over the Bruins Thursday night. The win extended Philadelphia's wining streak to six and Hart's personal streak to five. Despite giving up a goal in the opening frame by David Pastrnak for an early 1-0 lead for the Bruins, Hart turned aside 23 shots, including shutting down a great opportunity by the Bruins' All-Star with 2:05 remaining in regulation. With his final victory of the month, the native of Sherwood Park, Alberta, became the 10th goalie in NHL history to carry a personal winning streak of five games or more before the age of 21. The very next day, the NHL named Hart Rookie of the Month. The Flyers headed home to Wells Fargo Center Saturday to wrap up their week with the Edmonton Oilers in town. Down two goals early in the third period, Philadelphia rallied to a 5-4 win with two third-period goals (scored by Konecny and Wayne Simmonds) before Nolan Patrick sealed the game 2:01 into overtime for the club's seventh straight victory. Hart earned the game's third star and his sixth straight win with 40 saves, and climbed the list of young outstanding goaltending performances by becoming the sixth NHL goalie to have a win streak of at least six games before the age of 21. As the wins keep rolling for the club, Hart's confidence between the pipes has been translating into to confidence up front for his teammates. "It helps when you know that your goalie can go steal a game," Flyers forward Sean Couturier said postgame. "All you've got to do is keep believing. He gives us that confidence up front, just keep battling and whatever happens keep trying to score some goals." The Flyers continue their five-game home stand looking to extend their winning streak to eight games and collect their 2,000th franchise win on the line when they host the Vancouver Canucks Monday night (7 p.m. ET).